The mental health watchdog group, Citizens Commission on Human Rights (CCHR)International is offering Law Enforcement Officers (LEOs) and school officials a free copy of its compelling new report about a common denominator found in many mass shootings: psychotropic drugs. The report, called Psychiatric Drugs Create Violence & Suicide: School Shootings & Other Acts of Senseless Violence, provides information on more than 30 studies that link antidepressants, antipsychotics, psychostimulants, mood stabilizers and sedative hypnotics to adverse effects that include hostility, mania, aggression, self-harm, suicide and homicidal thoughts. The 64-page report details more than 60 examples of school and mass shootings, stabbings and senseless violent acts committed by those under the influence of psychotropic drugs or experiencing serious withdrawal from them. Jan Eastgate, President of CCHR International, said, “The goal of this report is to help law enforcement, educators and policy makers to learn how psychotropic drugs are a hidden link to the prevalence of violence and suicide in the community. Facts, statistics, studies and expert opinion in the report show the medical concerns about the rise of senseless acts of violence coincident with the increase in psychotropic drug prescriptions and usage. An Australian judge said an antidepressant was the “overwhelmingly probable” reason for turning a peaceful, law-abiding man into a brutal killer of his wife. A leading international psychopharmacology expert and professor of psychiatry reports: “Violence and other potentially criminal behavior caused by prescription drugs are medicine’s best-kept secret.” He also believes that an estimated 90 percent of school shootings, over more than a decade, were linked to SSRI antidepressants. 27 international drug agency warnings link psychiatric drugs to the adverse effects of violence, mania, psychosis or homicidal ideation; 49 warn of self-harm or suicide/suicidal ideation and 17 report addiction or withdrawal effects. The Adverse Event Reporting System (AERS) of U.S. Food and Drug Administration (FDA) has at least 1,530 cases of homicide/homicidal ideation associated with psychiatric drugs. Researchers took the FDA ADR data and identified 25 psychotropic drugs that are disproportionately associated with violence. Withdrawal effects from sedative hypnotics, also known as benzodiazepines, can last weeks and sometimes months or years, and include increased anxiety, perceptual distortions, depersonalization, paranoid thoughts, rage, aggression, and irritability, according to leading British expert with the Institute of Neuroscience, Newcastle University, Newcastle upon Tyne. Ann Blake Tracy, Ph.D., head of the International Coalition for Drug Awareness, says there is a whole new vocabulary today as a result of widespread antidepressant use, with terms such as “road rage,” “murder/suicide,” “going postal” and “suicide by cop.” For example, a suicidal veteran fired 11 shots during an encounter with police in Spokane, Washington, admitting during his trial that he had unloaded his gun (in the air) before walking out into the alley where he intended to provoke the police to shoot him as part of a “suicide by cop” plan. He’d been prescribed an antidepressant documented to cause suicidal thoughts. CCHR is clear that not every violent killer has been on or withdrawing from a psychotropic drug at the time of committing a crime, but in many cases such drugs emerge when learning of the killer’s background. “It begs the question whether in taking the drug or when the drug or other treatment failed them, did this help propel them on a path towards the destruction of others?” the report poses. CCHR says that in any official response to the Vegas concert shooting, Texas Church Shooter and Parkland Florida school shooting, LEOs, educators and legislators should not lose sight of the fact that there is a driving force behind someone picking up a gun, knife or even making a bomb to carry out violent and deadly acts. And there is sufficient evidence to investigate the role of prescribed mind-altering drugs in inducing altered states of mind in a percentage of people taking these drugs. Legislative hearings should be held to fully investigate the correlation between psychiatric treatment and violence and suicide. Toxicology testing for psychiatric drugs should be mandatory in cases where someone has committed a mass shooting or other serious violent crime, the information from which would become part of a national database that all branches and levels of law enforcement could access. 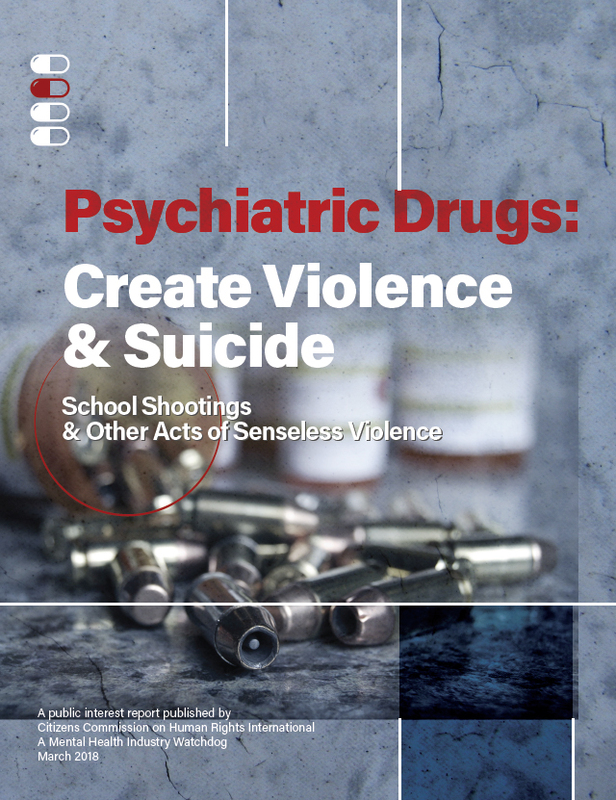 Law Enforcement Officers and School Officials wishing a free printed copy of: Psychiatric Drugs Create Violence & Suicide: School Shootings & Other Acts of Senseless Violence can email media@cchr.org. Sarah Boseley, “Prozac class drug blamed for killing,” The Guardian (London), 2 May 2001, https://www.theguardian.com/uk/2001/may/26/sarahboseley. Jim Rosack, “SSRIs Called on Carpet Over Violence Claims,” Psychiatric News, Vol. 36, No. 19, 5 Oct. 2001; David Healy,Andrew Herxheimer, and David B Menkes, “Antidepressants and Violence: Problems at the Interface of Medicine and Law,” PLoS Medicine, Sept. 2006, 3(9): e372, https://www.ncbi.nlm.nih.gov/pmc/articles/PMC1564177. “FDA Mulls Antidepressant Warnings,” Daily Press, 21 Mar. 2004, http://articles.dailypress.com/2004-03-21/news/0403210207_1_dr-joseph-glenmullen-corey-baadsgaard-school-shootings-and-murder-suicides. Patrick D. Hahn, “Antidepressants: a deadly treatment?,” Baltimore Sun, 11 Apr. 2015, http://www.baltimoresun.com/news/opinion/bs-ed-antidepressants-violence-20150411-story.html. John Horgan, “What ‘60 Minutes’ Gets Wrong in Report on Mental Illness and Violence,” Scientific American, 2 Oct. 2013, https://blogs.scientificamerican.com/cross-check/what-e2809c60-minutese2809d-gets-wrong-in-report-on-mental-illness-and-violence. “Psych meds linked to 90% of school shootings, WND, 18 Dec. 2012, http://www.wnd.com/2012/12/psych-meds-linked-to-90-of-school-shootings/#i1JviHwg3g2T7KSt.99. Thomas J. Moore, Joseph Glenmullen, Curt D. Furbert, “Prescription Drugs Associated with Reports of Violence Towards Others,” Public Library of Science ONE, Vol. 5, Iss. 12, Dec. 2010, http://www.plosone.org/article/info%3Adoi%2F10.1371%2Fjournal.pone.0015337. David Kirschner, Ph.D., “Mass shooters received only limited treatment,” The National Psychologist, 10 Sep 2014, http://nationalpsychologist.com/2014/09/mass-shooters-received-only-limited-treatment/102638.html. “Withdrawal from psychiatric drugs can be disabling and can cause a range of severe physical and psychological effects…,” Council for Evidence-Based Psychiatry, 15 Mar. 2015, https://ravimid.files.wordpress.com/2015/02/psychiatric-drug-withdrawal-can-be-disabling-010314-1.pdf. Joanna Moncrieff, M.B.B.S., David Cohen, and Sally Porter, “The Psychoactive Effects of Psychiatric Medication: The Elephant in the Room,” J Psychoactive Drugs, Nov. 2013; 45(5): 409–415, https://www.ncbi.nlm.nih.gov/pmc/articles/PMC4118946. C. Heather Ashton, DM, FRCP, “Benzodiazepines: How They Work and How to Withdraw,” Institute of Neuroscience, Newcastle University, Newcastle upon Tyne, 2002, http://www.benzo.org.uk/manual/bzcha03.htm. Ann Blake Tracy, “Suicide & Death Can Lurk in Each SSRI Pill,” http://www.rense.com/general77/lurk.htm. “Man seeking ‘suicide by cop’ found guilty of assault,” The Spokane-Review, 11 Feb. 2016, http://www.spokesman.com/stories/2016/feb/11/man-who-encouraged-spokane-police-to-shoot-him-fou/; Jeff Humphrey, “Army vet gets nine years for suicide by cop attempt,” KXLY, 3 Mar. 2016, http://www.kxly.com/news/local-news/spokane/army-vet-gets-nine-years-for-suicide-by-cop-attempt_20161121034442715/176407731.